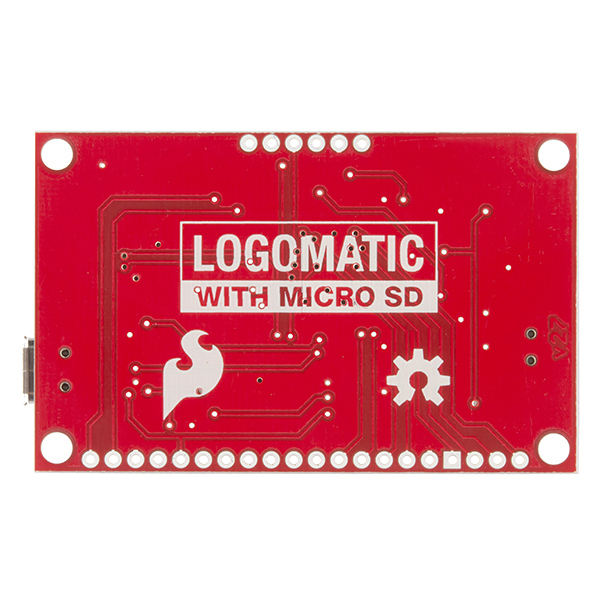 The SparkFun Logomatic v2 takes everything we learned with logging analog or serial data from your projects over the years and boils it down to an easy to use device, that is now more adaptable than ever! Version 2 incorporates the LPC2148 with microUSB, battery charging, FAT32 formatting, and microSD support. 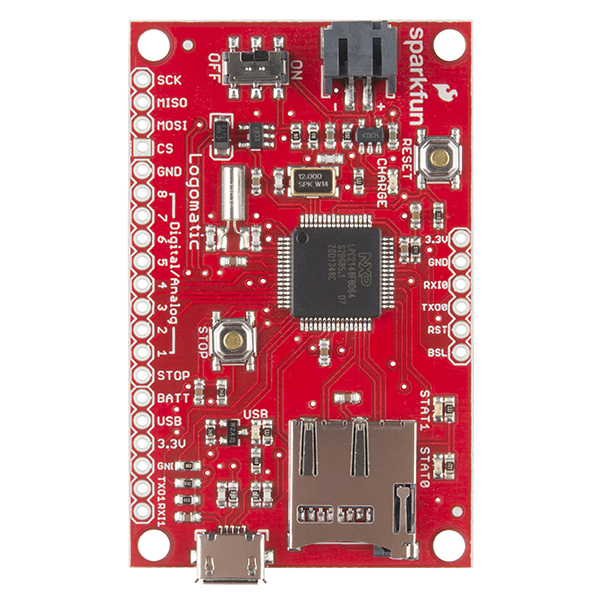 This allows us to use the SparkFun LPC2148 USB bootloader for even easier and faster modification of the firmware. No programmer required! The Logomatic v2 ships with basic serial text and analog logging. Users can easily start with this firmware but are encouraged to modify the firmware for their specific requirements. It's a truly flexible logger. I'm reading comments, and technical info, and it looks like this V2 Logger max's out at 2KHz sampling? Am I reading that correctly. I have a motor which will be spinning at 3500 RPM and has an encoder on it that outputs 20 pulses per revolution. Yeah, that's 70K pulses per minute (~1700 pulses per second). Am I understanding that this logger will be able to keep up? Moreover, can it keep up at this rate with multiple sensors running at this kind of speed? Because, I our team has a robot with 6+ motors, some of which we'd like to track tightly for variances in speed. What is the max write rate of this module? I am making an embedded system with this and aim to put in in a 3D printed case. I'd like to have a panel mount ON/OFF switch. I figured the Logomatic has a SPDT switch, and as such bought some panel mount ones. Does anyone know what type of switch this has? And the best way to go about soldering on a panel mount one? This is my first embedded system, and I'm a relative noob in general. Thanks in advance for any guidance! This is the switch that is onboard the Logomatic. You will want to solder jumper wires from your panel mount switch to the appropriate pins on the Logomatic (double check the Eagle files if you aren't sure which ones you need to connect). Alternatively, you could leave the switch on the Logomatic on the "ON" position, and add the panel mount switch in-line with your power supply to the Logomatic. How did you find out what model of switch the Logomatic has? Finally, I am also interested in adding a RGB LED to indicate the battery voltage. The setup for that and code is easy. My only problem is that when I do an analogRead of the voltage on the "BATT" pin, the numbers are way off. I know the code is correct for converting to the correct voltage. I used my multimeter to read the voltage between the "BATT" pin and ground...it will intermittently display the correct voltage (4.2V, for example) but not steadily. Did I just do a poor soldering job, or cause damage from too much heat? Why, oh why (!) didn't you include the ability to have a small coin cell to back up the RTC???? I've been asking for this for years!!! Yes, the entire device can run of a LiIon battery... but all it takes is a header to add an optional coin cell (or even the pads for a header!) to make it so that the RTC is useful! So sorry about that! We try to include all the feedback we can in new revisions, but apparently this one fell through the cracks. I'll get it added into a new bug right now for the future rev. Note that you can sleep the processor but keep the RTC running on the main power supply. The LPC RTC has a great alarm feature to wake it back up at a specific time and date as well. Can I use this to route power from a Li-Po Battery through the logomatic to an Arduino? Does anyone know how to/if it's possible to use this to periodically wake/turn on a Yun. I would like to send the datalog over wifi once a day. Any ideas/thoughts would be great! Very new here, apologies if it's a dumb question! What is the maximum current that we draw out of the 3.3V output? The LDO ref is not provided. FYI, you can also check my Open Source Voltage logger and Pressure & Temperature Logger projects that run on on my Scorpion Board. It uses log_fs a simple, but robust record-based file system for AT45D DataFlash that I'm quite proud of. Could you use this to emulate an SDIO card, or an SDHC card? I want to test something and be able to emulate the card plugged into a card slot. Thanks! This isn't really designed to interface with another card slot, since there is one on-board. However, you could hook it up via the data lines to another board's SD lines, but you'd still have to put an SD card in the Logomatic to have it function properly. Has anyone modified the standard code to respond via UART when an input is triggered? ie, log all incoming serial data AND if any Digital Input goes high send "Digital x Pressed" out the UART? "Digital x Pressed" would also be logged to the SD Card. Can anyone point me to an example of how to use the RTC on this device? Yes, having the RTC battery input would be very useful, not to mention that the voltage regulator draws more power that the CPU in power down mode. Also, the voltage divider network to read the battery voltage uses 1Meg resistors, but the input impedance of the ADC is approximately 40K - huge measurement error! Is there a sample output file posted anywhere? @Spakfun: The Github link above (30/June/2014) shows the firmware was last updated 10 months ago. It also shows the old 10216 product photo and information. Can this be updated to reveal the most recent firmware, and can you please confirm that this new firmware is suitable with the V2 hardware (prod code10216) Fanks! Ah, yea we have to get the links updated between the two versions. The new firmware is compatible with the old v2 hardware! I was wondering if the Jumentum software (http://jumentum.sourceforge.net/) could be loaded onto this, then you could write your own BASIC program to do the data acquisition. I have the Logomatic v2 that I ordered in 2013. The PN is WIG-10216 and it is from Batch # 30804. Can this version have its firmware updated to run the new FAT32 firmware or did you make a PCB change since then? If I'm remembering correctly, I think the one I bought only had FAT16 on it. Yup, you should be able to update the firmware without issue. We did make some minor hardware changes, but mostly to help improve our production process and minimize errors during the builds. When I first saw this I was like what is a logo-matic (shows company logo?). Then I realized log-o-matic. I feel dumb. I'm intrigued.... Why is the shipment of this product to some territories restricted? It's a general restriction on the LPC ICs. So... why is this restricted but the MBED board not? 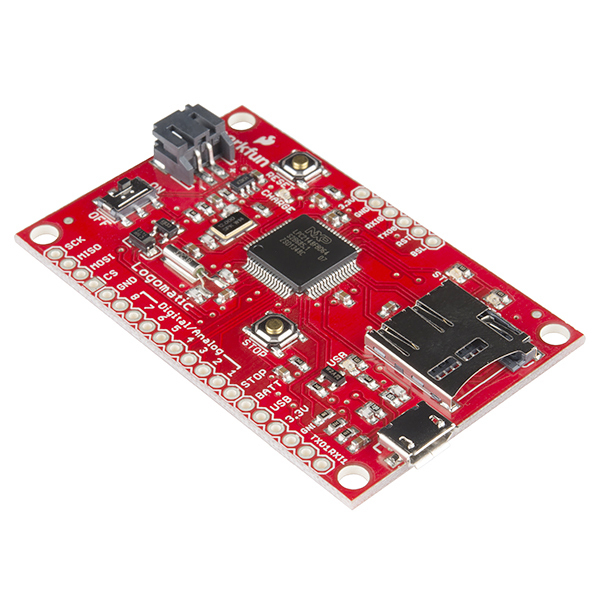 The MBED board uses a LPC and is more powerful! With 8 IO lines, you have a wide variety of options to control/read. With a simple mod, you can control when the attached battery charges when not plugged into the micro USB. I am so glad that this is now a FAT32 version therefore it can use larger SD cards and I can now easily buy some for in it. It is a very stable board, the programming can throw some people off. I would recommend this Logger to anyone who doesn't have the time or resources to make their own. Add a MAX232 to talk to PC. Improve description to specifically mention that this is only a TTL serial logging device, and additional parts are needed to talk via RS232. The good: 1) Documentation is spot on! 2) I found new tools to use and debug with. 3) logging and code manipulation is easy. 4) Portability is fantastic. 5) Large data storage card is fantastic and very desirable. This thing works if you want to log at slow-ish speeds for short periods of time. The sample range is from 2kHz max (for 1 channel I believe) down to 1Hz (which is still too fast in some applications). So this is more of a long-haul type of logger, which makes sense. But "long" is a loose term here. I've used the thing for some time now and I can't seem to get the logger to last longer than 1.5 days on a 2000mAh LiPo battery logging at the slowest speed. Considering the size of the battery and the sampling frequency, this is pretty abysmal. One of the culprit is a red LED that stays on all the time, but I also suspect the MCU doesn't go to sleep, even when sampling at 1Hz. I suppose one could depopulate the LED go change the firmware to resolve some of these issues, but I was really hoping to have this work out of the box. If you're looking to log at a slow-ish speed for a short period of time (e.g. capturing data from a launching rocket), this might be the logger for you. 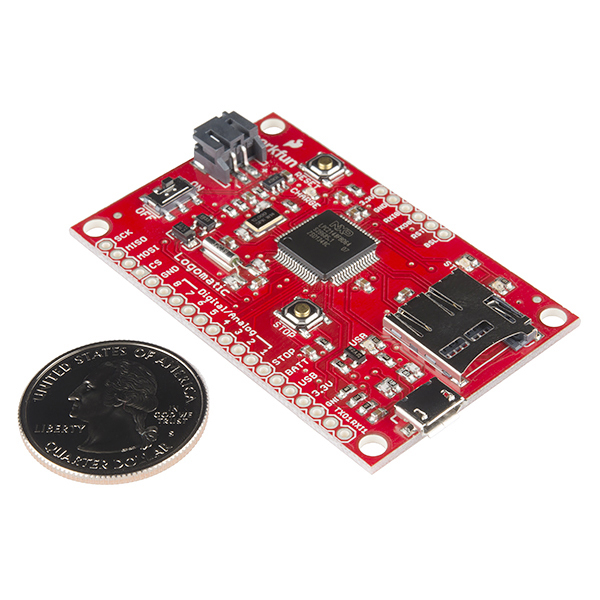 Otherwise, Sparkfun's OpenLog board (https://www.sparkfun.com/products/9530) might be a better fit. P.S. As an aside, the config file is needlessly confusing and I always end up having to refer back to the hookup guide to help me out. I got this logger to use for a project I am working on. I started with using it to log analog values and modified the code from there. The information below is related the stock code that comes with the logger. The schematics are poorly written. Several of the labels on the microcontroller pins do not match up with the labels on the connector pins. The code does not have many comments so it takes a while to figure out what is going on before trying to modify the code. The settings above work out to 117187 baud. I found this because I was having problems with getting garbage serial data when reading a long string. I changed the baud settings to the ones below and the serial data was read in correctly. Sorry about the issues with it. We really appreciate the constructive feedback, and will keep it in mind for future revisions of the product. For the price, this is a decent device. It does have some weak points though. The microusb connection to the board is flimsy. Don't expect to be able to connect/disconnect more than a few times before it starts to come away. I have connected a short microusb extension cable so that the stress of repeat connects is transferred away from the board. Before that I lost a few boards when it broke away. There should be a breakout for the on-off switch so that it can be operated external to whatever housing you put the board in. Essentially you have to toggle the switch each time you connect to USB, so this needs to be made easier. The voltage in pin is labeled "Batt". It is versatile, having both ADC pins and SPI, but both can not be used at the same time. The addition of SPI C++ code examples for the various Arduinos would be very helpful. Gave the device a bad review but understand that it may have been the voltage from a 2S LiPo. Don't use a 2S LiPo on this board. Will review once again soon. Customer service has been excellent in assisting us with our troubles even though we may have caused the issue. This is an exceptionally large failure rate. Please contact techsupport@sparkfun so they can help you troubleshoot what happened with your boards. If there was indeed a failure on the board hardware, we can get you set up with replacements. The data logger was recommended to me by a Sparkfun tech. with the understanding that it would easily connect to a 9DOF sensor stick, however, it does not. The problem is that the sensor transmits with I2C but the logger does not and we could not easily find any open sourced programming to support the two components. We finally ended up buying an Adafruit 9 do that has better supporting programming And we now hove no use for the components we purchased from Sparkfun. I'm sure they work fine but the combination for our use did not work. Hi, This logger is setup to log analog or serial data from your project. If you want to log information from an I2C device you would need something like an Arduino to interpret the I2C line, and transfer the data out over serial. Sorry these parts didn't fit your needs. ... because I need to time stamp my analog data but the few existing SW examples are too complicated or not enough documented for me to adapt the firmware by myself !